An on-the-ground report from post-coup Turkey, where the Kurdish press is facing stepped-up repression. 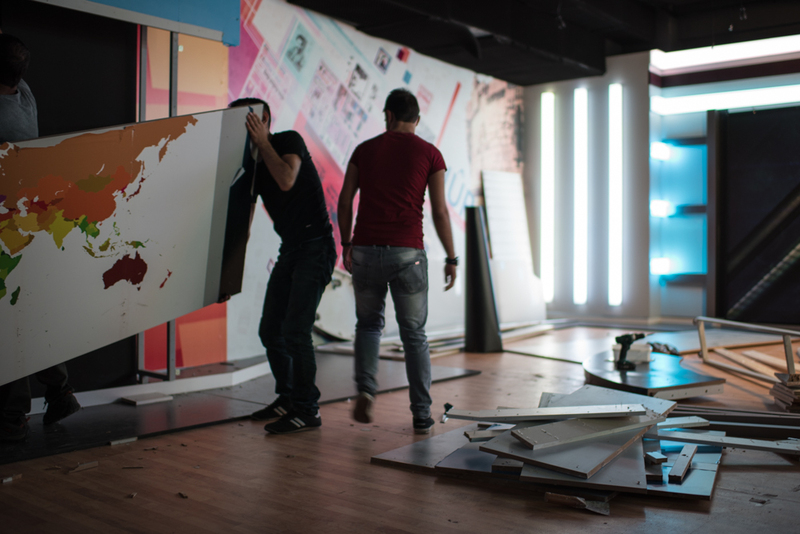 Earlier this month, as he watched crew workers dismantle his television studio, Barış Barıştıran, chief broadcasting manager at Özgür Gün TV, told me that running a Kurdish news channel has never been easy in Turkey — but it’s never been this hard. A week earlier, Barıştıran received a text message from the station’s satellite service provider saying they would stop broadcasting Özgür Gün TV, downgrading the channel from a national network to a local station reliant on landlines. With the station’s audience now diminished, advertisers dropped their contracts, and Baristiran, no longer able to afford the rent on the TV studio, was forced to move operations to another location. Özgür Gün TV has been broadcasting from Diyarbakır, Turkey’s largest Kurdish-majority city, in one form or another since 1995. As with all other Kurdish media in the country, the station has long confronted obstacles in its coverage. It’s been penalized for broadcasting interviews with Kurdish politicians, and had its websites and social media accounts blocked repeatedly by telecommunications authorities. In October 2015, a plainclothes police officer put a gun to the head of one of its reporters while he was covering military operations in the southeastern city of Silvan. This too was nothing new for Kurdish journalists. What mattered was that the TV crew was able to continue broadcasting afterwards. “As you see, that’s not the case anymore,” Barıştıran said, as workers laid down a world map printed on composite board that, moments earlier, had served as the backdrop for the news studio. The crackdown on outlets like Özgür Gün TV is part of a broader wave of government repression since the failed coup attempt in July. Over the last two months, 43,000 people have been detained, and 100,000 workers have been dismissed from government payrolls for alleged links to Fethullah Gülen, the US-based cleric blamed for orchestrating the putsch. A nationwide state of emergency also remains in effect, allowing the government to hold individuals for thirty days without charge. Authorities have used the state of emergency and decree laws to jail 120 journalists and close more than 100 news outlets for allegedly spreading terrorist propaganda. While the majority of journalists and news organizations targeted were directly or indirectly linked to Gülen organizations, many media outlets on the hit list were run by Kurds — many of whom detest Gülen as a racist and have no ties to his followers. Numerous leftist and investigative journalists have also been swept up in the crackdown, indicating the initial purge has expanded beyond suspected coup-plotters and is now hitting the opposition more broadly. The move to silence alternative news sources comes at a tumultuous time for Turkey, a country where most mainstream outlets are state-run and journalists stay employed mainly through self-censorship. The best-informed citizens have come to rely on their Twitter feeds for relatively unfettered news, but the clampdown on Kurdish and opposition media is further restricting access to information. Media rights advocates say the state of free speech in Turkey has never been more threatened. 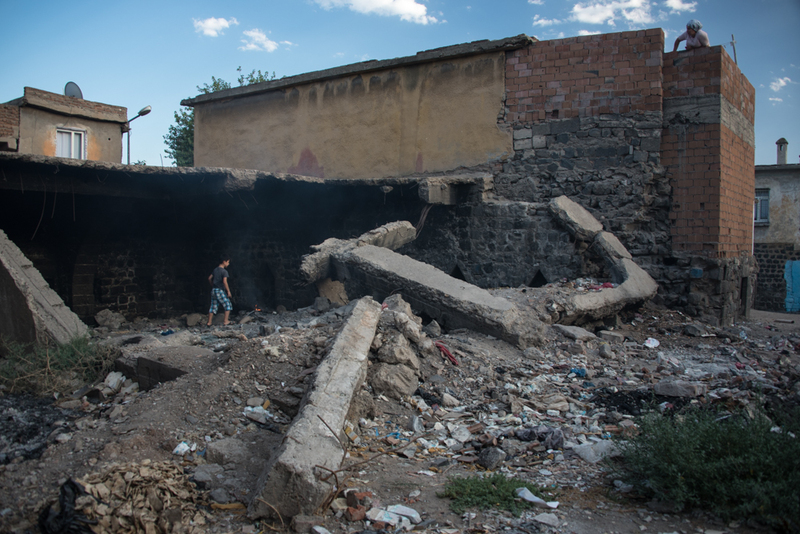 About 20 million Kurds live in Turkey, comprising a quarter of its population. They’ve been oppressed and marginalized since the country’s founding, barred even from teaching their own language until the 2000s. In 1984, unwilling to see Kurds live as second-class citizens, the Kurdistan Workers’ Party (PKK) launched an armed rebellion to create an autonomous state. The state responded with force, and the conflict soon escalated into a full-fledged war; forty thousand people have died in the decades since. 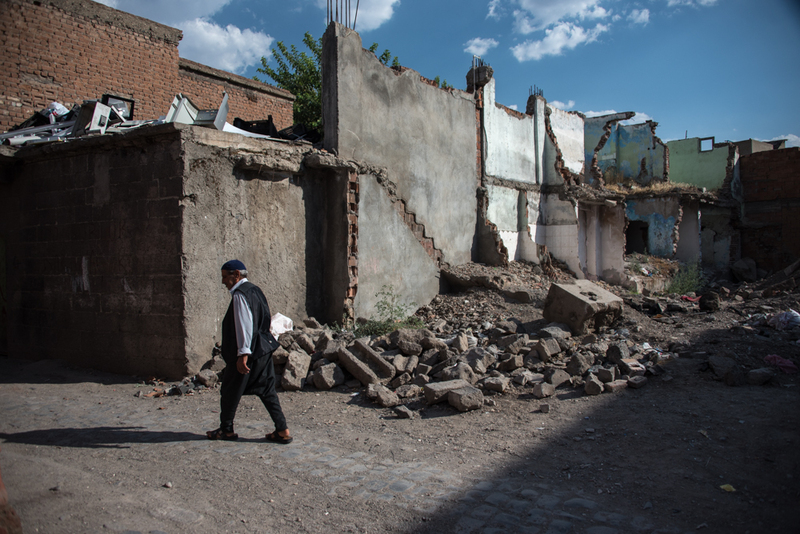 A peace process to quell the fighting began in 2013, briefly improving conditions, but negotiations broke down in July 2015 as military operations and round-the-clock curfews were imposed on Kurdish-majority cities in the nation’s southeast. Erol Önderoğlu, Turkey’s representative for Reporters Without Borders, says it was during the renewed fighting that the ruling Justice and Development Party (AKP) restarted its attacks on the Kurdish media. After the peace process collapsed, “the state held a summit with mainstream media editorial boards and clearly marked a red line, warning them by saying, ‘You are with us or you are against us,’” Önderoğlu says. Mainstream outlets obliged, toeing the government line in their coverage of military operations. But Kurdish and opposition news outlets continued their reporting in conflict zones, running stories contradictory to those of government-friendly sources. Önderoğlu says the AKP then stepped in to limit such reporting, claiming it was undermining efforts to defeat Kurdish militants, and has only increased its repression in the months since the failed coup attempt. Eren Keskin, co-editor of the recently shuttered Özgür Gündem newspaper, worries that attacks on Kurdish outlets also limit their ability to report on Turkey’s ongoing involvement in the Syrian war. On September 4, Turkish tanks entered Syria to expel ISIS fighters and block the movement of Kurdish militias, who had secured a string of victories against ISIS in the area. One of Turkey’s leading Kurdish newspapers, Özgür Gündem was shut down on August 18 when authorities raided its Istanbul headquarters and arrested twenty journalists inside, claiming the paper was acting as a “mouthpiece” for the PKK. Speaking on the phone from Istanbul, Keskin told me her passport had been revoked, her home in Diyarbakır had been raided by masked police, and that she now faces a life sentence for being the leader of an alleged terrorist organization. Keskin, an internationally recognized human rights activist and lawyer, is well known for representing victims of sexual violence inflicted during military operations in Turkey’s southeast. She does not claim to be a journalist and said she took the role of co-editor as a show of solidarity with the paper’s former editors, many of whom have been detained or murdered since publication opened in 1992. “Özgür Gündem is the only paper that writes about what’s really happening in Kurdistan,” Keskin says. As part of her court order, Keskin now has to visit her local police station once a week to sign in and confirm her presence in Turkey as she awaits her court case. “By putting me on trial, they are trying to show that they can prosecute anyone they want to, anyone that stands up, and that they don’t need evidence to do it,” Keskin says. Despite the inhospitable environment, Kurdish journalists continue filling the vacancies left by reporters in detention. Ramazan Ölçen, publisher of Azadiya Welat, one of Turkey’s few Kurdish-language dailies, says citizen journalists often use smart phones to send videos and photos to the publication. Yet Azadiya Welat has also seen dozens of its reporters detained since the state of emergency decrees. 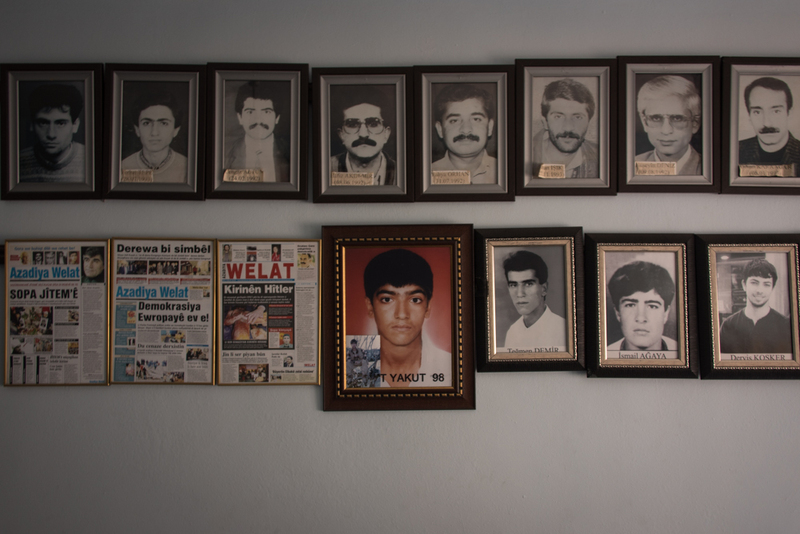 Speaking in his Diyarbakır office, Ölçen pointed out the many portraits on his wall honoring journalists killed while working for the paper. To continue his work, he says, is to pay his debt to the martyrs of Kurdish journalism. “If we were doing this kind of journalism in another part of the world, we would get international awards, but here, our reward is punishment,” Ölçen says. Nevin Erdemir, a journalist and co-chair of Turkey’s Free Journalists Organization, says she spent two and a half years in prison for her work and has faced more court cases than she can count. She was once arrested for interviewing Selahattin Demirtaş, co-chair of the leftist, pro-Kurdish Peoples’ Democratic Party (HDP). Another time, she was punished for standing next to a Kurdish politician during a televised press conference. In her most recent court case, Erdemir says she was detained for four days in February for driving with a radio transmitter in her car near Mardin, a city in southeast Turkey. Authorities claimed she was planning to use the transmitter to detonate a roadside bomb, citing a receipt as evidence a terrorist organization had paid her for the job. She laughs as she explains the charge — such encounters are becoming normal. And with the post-coup purge now spreading to all spheres of Kurdish society, the need for different voices couldn’t be greater. Just over the last week, twenty-four Kurdish mayors were replaced with unelected state trustees and 11,500 Kurdish educators were suspended as the school year began. Both groups were dismissed for suspected links to the PKK. Meanwhile, members of the HDP, the country’s third-largest opposition party, await hundreds of court cases this fall after the Turkish parliament voted to lift legal immunities for elected officials. Back in the Özgür Gün TV studio, Barış Barıştıran tried to put a positive spin on his circumstances. While the station’s operations may be moving, they will continue nonetheless, perhaps under a different name, just as they always have. And a smaller studio will cost less, helping compensate for the increasing number of fines slapped on the station. Undeterred, Barıştıran said he sees freedom of speech for Kurdish media as a barometer for the overall state of human rights in Turkey. When Kurds are oppressed, all Turkish citizens are susceptible to the same treatment. Viewed this way, the fight to expand media liberties for Kurds is a fight to improve basic liberties on a societal level, and eventually, Barıştıran believes he will prevail.